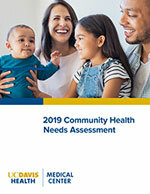 This report details the priority health needs of the people UC Davis Medical Center serves, based on the 2016 community health needs assessment. View the latest issue of UC Davis Health, a publication for alumni, donors, faculty and friends. University of California offers its employees some of the most attractive employment packages and career opportunities available. © 2017 The Regents of the University of California.